The economic turmoil in the eurozone took a heavy toll on the value of Europe's automotive sector in the third quarter of this year. The setback was severe, affecting suppliers and retailers as well as vehicle manufacturers. 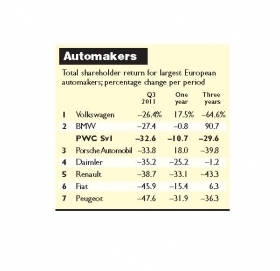 Not one of the 35 stock exchange quoted companies included in the Automotive News Europe/PricewaterhouseCoopers Transaction Services Shareholder Value Index avoided a setback, with 10 relinquishing more than 30 percent in the quarter and a further five losing more than 40 percent in value. This follows a buoyant second quarter in which five of the seven automakers achieved double-digit growth, leading to hopes that the industry could outperform European stock markets in the remainder of the year. But third-quarter declines in shareholder value of 32.6 percent for automakers, 33.7 percent for partsmakers and 25.9 percent for vehicle retailers shows such optimism was misplaced. These Q3 declines compare with more modest falls of 25 percent in Germany's DAX30 and France's CAC40 indices and 8 percent in the UK's FTSE 100 over the same period. Amongst automakers Volkswagen AG and BMW AG fared best, but still were hit by hefty declines of 26.5 percent and 27.4 percent, respectively. Both companies continue to fare well in the marketplace, with VW intent on becoming the world's largest manufacturer through its multiple brand strategy by 2018. 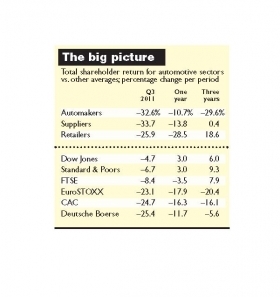 It was the only carmaker to record a shareholder value gain in the index in Q1 this year. Against a background of increasing discounts and tightening margins at the luxury end of the market, BMW still fares well in terms of sales against Daimler's Mercedes and VW's Audi brands. Analysts are still expecting BMW's earnings, which come from motorcycle sales and financial services operations as well as cars, to jump by a third on last year's 1.19 billion euros. At the other end of the scale, however, PSA/Peugeot-Citroen SA, Fiat S.p.A. and Renault SA recorded value declines of 47.6 percent, 45.9 percent and 38.7 percent, respectively. Heavily dependent on its domestic French market, which accounts for more than 60 percent its sales volume and more than that in revenue, PSA is widely believed to be potentially the worst automotive casualty of the region's sovereign debt crisis. It had a significant decline in unit sales in September. The Italian national debt crisis took its toll on Fiat, the top performer in the previous quarter, while Renault was not helped by a five-week strike at one of its suppliers. "The auto industry had shown signs that it could overcome negative factors influencing consumer sentiment in home markets and that growth in non-European markets would help to bolster sales," said Jason Wakelam, leader of PwC UK's Automotive Transaction Services. "However, the combination of a European national debt crisis and sluggish US growth proved extremely challenging in the third quarter." 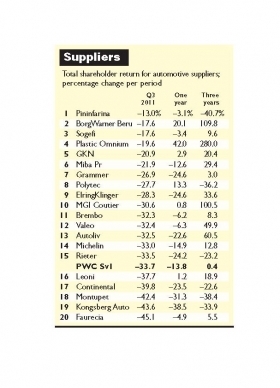 Until Q3 this year, the suppliers group had been the only category in the Automotive News Europe/PricewaterhouseCoopers Transaction Services Shareholder Value Index that had managed to record positive growth in every quarter since the beginning of 2010. But the reversal in its fortunes was sharp when it arrived in the third quarter of this year. In Q2, growth signs had outnumbered minus signs by a 2-to-1 margin, with the index showing that only two companies had recorded a decline of more than 10 percent in their value to shareholders. In Q3, however, every supplier recorded a decline of more than 10 percent and more than half had value falls greater than 30 percent. Italian design and engineering specialist Pininfarina, which now anticipates a return to profit at gross operating level in 2011, topped the list with a decline in value of just 13.0 percent. It was followed in second place by ignition specialist Borg Warner Beru, which was down 17.6 percent. French-based seating and interiors specialist Faurecia SA suffered a similar fate as its majority owner, PSA/Peugeot-Citroen SA, finishing at the bottom of its group with a 45.1 percent decline in value. Falling 43.6 percent, Norwegian seat, driver controls, cable and hydraulics specialist Kongsberg Auto was affected during the quarter by delays in receiving payment from Saab and by a vehicle recall involving Bombardier Recreational Products and Teleflex Inc., which was only resolved in mid-September. Kongsberg is the only company in this group to have recorded declines in all three quarters so far this year. French manufacturer of aluminium cylinder heads and other components, Montupet, was also down by more than 40 percent, partly due a strike by workers in September and plans to downsize its work force. After solid performances in the first six months of the year, Hanover, Germany-based Continental AG, one of the top five in the automotive supplier industry by sales, relinquished ground, dropping 40.0 percent. 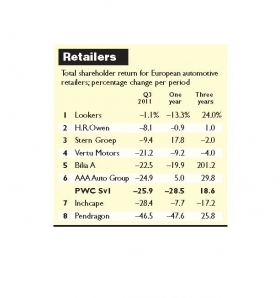 Fortunes were mixed in the retailer category of the Automotive News Europe/PricewaterhouseCoopers Transaction Services Shareholder Value Index. The declines for this group in the first two quarters of the year had been extremely modest – down 3.35 percent and 0.5 percent in Q1 and Q2, respectively. In Q3 the average decline in shareholder value for the category as a whole was 25.9 percent. But this included a decline of just 1.1 percent for Lookers at one end of the spectrum and 46.5 percent for Pendragon at the other. For UK multi-franchise dealer group Lookers, the result was positive, marking steady progress from bottom of the table position in Q1 to mid table in Q2. Trading remained satisfactory for the group in a difficult market and it achieved an increased share of a declining market for new and used cars. Sales of surplus assets raised funds, which have been used to repay bank debt. UK luxury car specialist HR Owen and Stern Groep, the largest car dealer in the Netherlands, each managed to keep their declines in shareholder value in Q3 to below 10 percent. HR Owen doubled its profits in the first half, but at the same time slashed its dividend by 75 percent to help fund its new growth strategy. This strategy has included the opening of a specialist Ferrari outlet in London and a move into the Aston Martin franchise for the first time through the acquisition of Broughtons of Cheltenham. The worst performance in the retail group came from UK franchise operator Pendragon, which was down 46.5 percent. A third of the company's deep discount 75 million pound rights issue was left on the books of the underwriters. The cash-raising exercise was needed to reduce its debt following its 500 million pound acquisition of competitor Reg Vardy. The company has also had to give pension trustees 36 million pounds of security in 17 of its properties in exchange for wiping out the 40 million pound pension deficit. Elsewhere, UK dealer group Inchcape declined 28.4 percent. In August the company acquired the remaining 24.9 percent share in Russian automotive retailer Musa Motors for $272 million. Performance, however, was restricted by supply constrictions on Japanese-made products, declines in new car markets such as Asia-Pacific and slow growth in other markets, such as Russia. Despite a rise in first-half earnings and revenue, AAA Auto Group NV relinquished 24.9 percent of its shareholder value. This was said to be due to uncertain global economic conditions and stiff competition in its main eastern European markets.